Scientists Say Child's Play Helps Build A Better Brain : NPR Ed Children learn their most important lessons on the playground, not in the classroom, researchers say. 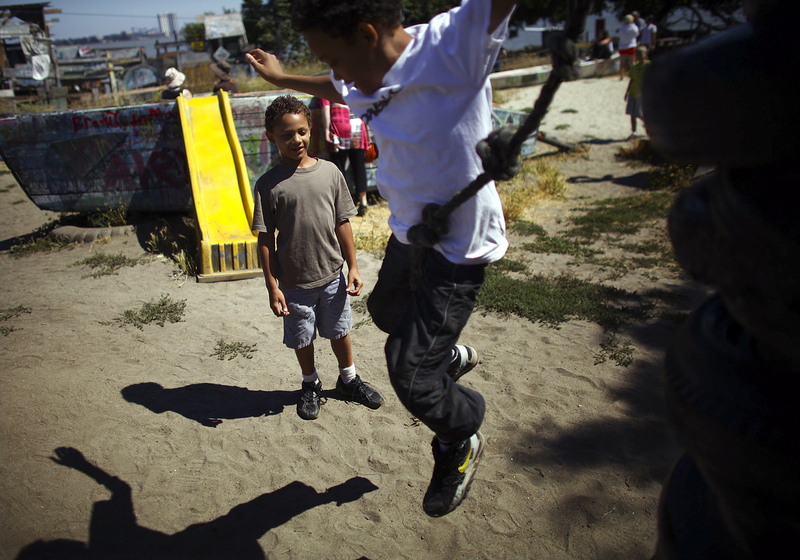 Deion Jefferson, 10, and Samuel Jefferson, 7, take turns climbing and jumping off a stack of old tires at the Berkeley Adventure Playground in California. 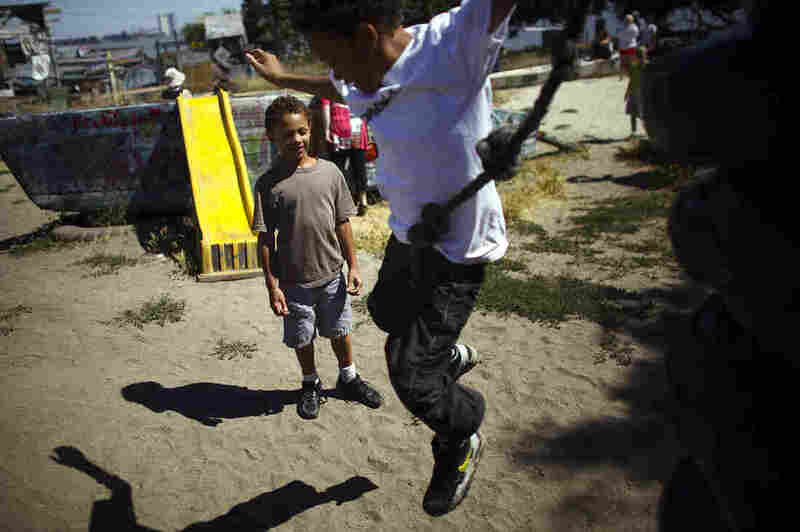 The playground is a half-acre park with a junkyard feel where kids are encouraged to "play wild." Free, unstructured play is crucial for children to build the skills they'll need to be happy, productive adults. 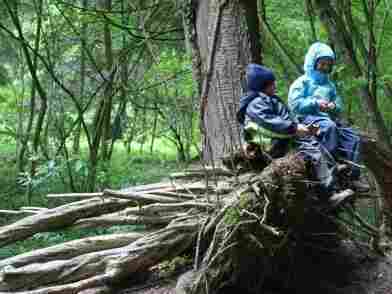 At a school where free play and exploration are encouraged, children can educate themselves under the right conditions. Much of what scientists know about this process comes from research on animal species that engage in social play. This includes cats, dogs and most other mammals. But Pellis says he has also seen play in some birds, including young magpies that "grab one another and start wrestling on the ground like they were puppies or dogs." For a long time, researchers thought this sort of rough-and-tumble play might be a way for young animals to develop skills like hunting or fighting. But studies in the past decade or so suggest that's not the case. Adult cats, for example, have no trouble killing a mouse even if they are deprived of play as kittens. Where does play come from? Neuroscientist Jaak Panksepp gives a playful answer in this NPR animation. So researchers like Jaak Panksepp at Washington State University have come to believe play has a very different purpose: "The function of play is to build pro-social brains, social brains that know how to interact with others in positive ways," Panksepp says. Panksepp has studied this process in rats, which love to play and even produce a distinctive sound he has labeled "rat laughter." When the rats are young, play appears to initiate lasting changes in areas of the brain used for thinking and processing social interactions, Panskepp says. The changes involve switching certain genes on and off. "We found that play activates the whole neocortex," he says. "And we found that of the 1,200 genes that we measured, about one-third of them were significantly changed simply by having a half-hour of play." Of course, this doesn't prove that play affects human brains the same way. But there are good reasons to believe it does, Pellis says. 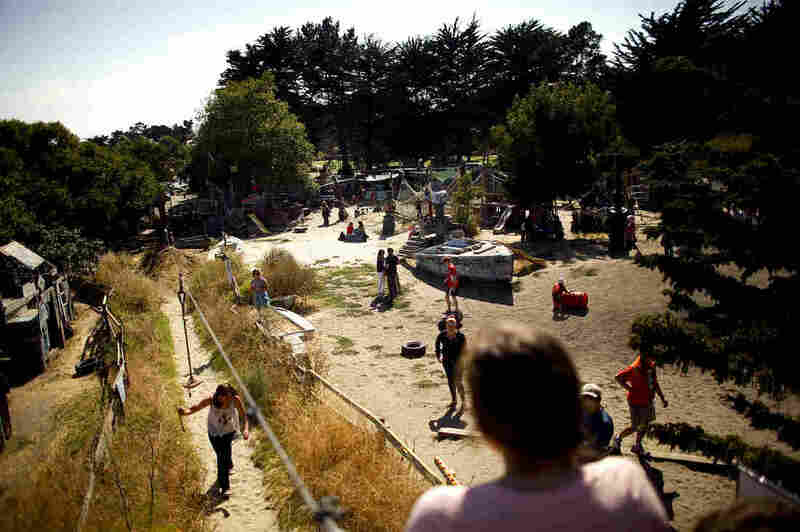 An overview of the Berkeley Adventure Playground, where children and their parents can paint, hammer, saw and run free. For one thing, he says, play behavior is remarkably similar across species. Rats, monkeys and children all abide by similar rules that require participants to take turns, play fair and not inflict pain. Play also helps both people and animals become more adept socially, Pellis says. And in people, he says, an added bonus is that the skills associated with play ultimately lead to better grades. In one study, researchers found that the best predictor of academic performance in eighth grade was a child's social skills in third grade.